There are several options to consider when lighting your home. Incandescent bulbs are on their way out, with the federal ban on them beginning in 2007 and the full phase out scheduled for this year. There are also compact fluorescent lightbulbs (CFLs) which have a distinct curly or multi tubed shapes. There are also light emitting diode (LED) bulbs that use several small diodes to light the whole bulb. Both CFLs and LEDs are more efficient than incandescents, so they use about 80-85% less electricity. That energy savings adds up to a lot of cash, too, considering that lighting can account for up to 25% of your electricity bill. The incandescent light bulbs we know today were a culmination of several inventors. The first was invented in 1802 by Humphry Davy using a platinum filament. Incandescence is heating a wire filament to the point where it glows. Many early incandescent bulbs contained carbonized bamboo filaments. Several other patents were issued and Thomas Edison help streamline the commercialization of the light bulbs in the late 1800s. However, it was the Hungarian and Croatian team of Sandor Just and Franjo Hanaman that invented the tungsten filament incandescent bulb in 1904 that we use today. The downside to incandescent lights is that 90% the energy consumed is given off as heat. The remaining 10% of energy is the light that we see. These bulbs are terribly inefficient, requiring a lot of energy for very little light. These bulbs also only last about 1200 hours, or about 2 years worth of use at a rate of 3 hours per day. Compact fluorescent lamps use between 75-80% less electricity than incandescent bulbs to give off the same amount of light. Instead of heating a wire filament, a CFL bulb is filled with argon gas and a small amount of mercury vapor. They can last about 10,000 hours or 9 years based on 3 hours of use per day. With the energy they save, they pay for themselves in about 9 months, but some people are leery of their use because of their mercury content. They only contain about 4 milligrams of mercury. For comparison, a mercury based household thermometer contains about 500 milligrams of mercury. Some bulbs contain as little as 1 milligram of mercury per bulb. CFLs also can take some time to reach full brightness, and they are not good with constant cycling (turning on and off). Light emitting diodes are made from semiconductors that are attached to electric leads, and when the juice starts flowing, the diode emits a brilliant light. 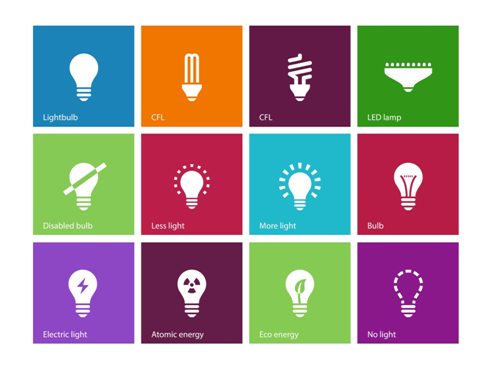 LEDs are 80-90% more efficient than incandescent bulbs, and can last up to 100,000 hours. Their lifespan is about 25 years with 3 hours of use per day. These bulbs, with their long lifespan, low cost to use, and low energy consumption, they are the ideal source of light for our homes. The biggest downside to LEDs is the cost per bulb is relatively high. Besides switching to energy efficient bulbs, you can lower your monthly bills by switching to a Houston electricity company that offers cheap electricity. You have the power to choose your energy provider. Shop Houston Electricity can help you sort through plans by provider, price, and options like renewable energy. The cheapest electric rates are at your fingertips! With all of the lights, appliances, and electronics in our home, it may come as a surprise to some that the little thermostat on your wall controls about half of our home’s energy use; more than the aforementioned categories combined. Using thermostats that aren’t programmed to your daily schedule could be costing you about $173 each year. Programmable thermostats allow you to schedule when your heating and air conditioning run. By doing this, they can remain off overnight or while you are at work. The Nest thermostat takes this a few steps further. Nest thermostats are programmed by you “teaching” them when you want the temperature to be set to your preferred level. It learns your schedule based on your habits and will set itself to the appropriate temperatures throughout the day, without any need for personal input. The thermostat also has an “Auto-Away” setting that shuts the system off when you leave your house. This feature works in about 90% of homes, even if you don’t pass by the Nest panel on your way out the door. The thermostat also has a few tricks up its metaphorical sleeve to help you save even more energy. The Leaf icon appears on your thermostat when your temperature is set to an energy saving temperature. Just a single degree can affect energy usage by 1-5%. The Airwave setting decreases your AC’s running time when the humidity is low. Your home will remain cool, but you’ll also save energy. An auto-tune setting helps you save energy by automatically adjusting the timing of cooling and heating during high use times. The Nest thermostat is designed to work with several different heating and cooling systems. Most systems are forced air, but the Nest works with radiant and heat pump systems as well. The True Radiant setting keeps your home temperature even, so you’re not raising and lowering the heat trying to stay comfortable. The Heat Pump Balance setting optimizes auxiliary heat systems and allows you to tune them for comfort or savings. Finally, the Nest will alert you when it’s time to change the filters. Clogged filters reduce airflow, which makes the system work harder. Cleaning these filters can improve your energy efficiency by about 5%. In addition to a Nest thermostat, you can save money on electricity by switching to a new Houston electricity provider. Shop Houston Electricity gives you the power to choose an energy provider that will meet their needs. You can search through plans for the lowest rate, renewable energy usage, and some special perks like e-billing discounts. Saving energy while getting cheap electricity is a great way to keep you feeling comfortable in your home. Summertime brings with it high energy bills due to the need to keep our homes cool in the intense heat. One of the best ways to keep your energy bills low is to choose a Houston electricity provider with cheap electricity rates. There are also ways to reduce your Houston electricity usage, which will allow you to keep cool while saving energy and money. Most of these methods require no extra cost, just simple, easy to implement actions. Thermostats — Keep the thermostat set as high as you can tolerate. Every degree above your preferred temp can save you 1-3% on your AC energy use. Shut the thermostat off at night and open your windows to let in natural, cool air. This will keep your AC from running all night. Consider installing a programmable thermostat to help regulate the temperature of your house year-round. The programmable thermostat will run the AC or heat only when you set it to, so it can remain off overnight or while you are at work. Fans — Ceiling fans can help you feel cool while using less electricity than an AC unit. Using fans in conjunction with the AC will allow you to set the temperature even higher and still remain comfortable. Landscaping — Strategic placement of trees and shrubs can shade your home in the summer, keeping your home’s temperature lower. These plants can also serve as windbreaks, which can reduce the energy use in the winter by 20-40%. Windows — Install windows with an argon gas filling to reduce solar gain and heat loss for the summer and winter, respectively. 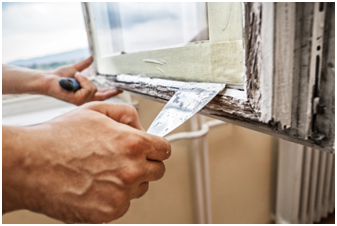 You can also coat windows with a low-e film to help with this. Also consider installing removable or retractable awnings on southern-facing sides of your home. The shade will reduce the amount of solar gain and provide a shaded area to sit outside. Remove or retract the awnings for the winter to gain the benefit of solar gain. Roof — Reflective roofs can reduce the roof’s temperature by up to 60°F, which will keep your attic space much cooler and reduce your energy needs. A green roof can also be used to reduce roof temperatures while providing a green space where you can plant flowers or foods despite limited property space. Maintenance — Maintain your AC system by cleaning or replacing the filter every 1-3 months and getting a tune-up every 6-12 months. Keep your AC running efficiently to ensure the airflow is high and energy use is low. You can beat the heat and keep greener in your wallet by using these tips and signing up with a Houston electricity company that will provide you with cheap electricity. Shop Houston Electricity helps you find the best deal from competing energy providers and gives you the power to choose the provider and the plan that’s right for you. Choosing an electricity provider that offers cheap electricity is a great way to save on your energy bill, but there are a lot of other ways to save. Using less energy and making your home more efficient will net you huge savings that can benefit you year round. Most of these tips are easy to implement and won’t cost you anything. Some of them require replacing inefficient parts of your home. While these will cost you extra money and time, they will often pay for themselves in energy savings. Keep your refrigerator set between 37° and 40°F and your freezer between 0° and 5°F to maximize efficiency. Keep the fridge as full as possible, but don’t stuff it. There needs to be some gaps for the cooled air to get around. If you have a lot of empty space in your fridge, fill it with gallon jugs of water. Vacuum the condenser coils every three months to keep them working efficiently. Allow foods to cool before storing them in the fridge, and remove all ingredients at once before cooking, to keep the door from being open too long. If your fridge is more than 12 years old, consider upgrading to an energy efficient Energy Star certified model. Use the smallest appliance for the job. Microwaves and crock pots use a lot less electricity than ovens and stove tops. When using the oven, remember to keep the door shut. Every time you open it, you can lose up to 50°F of heat. Avoid using the self cleaning function unless you really need it. Scrape off food bits before washing your plates in a dishwasher. Soak or prewash only if the plates really need it. Wash only full loads of dishes or clothes in their respective washers. The machines use the same amount of energy, whether it’s a full load or quarter load. Use only recommended amounts of cleaning agents. Too much can decrease the efficiency of your machine. Clean lint filters after every wash, and let clothes air dry whenever possible. Water heaters are set to 140°F by default, but lowering that setting to 120°F can save you up to 10% on your energy bill. Insulate the hot water pipes leading from your water heater. Uninsulated pipes lose their heat pretty fast, meaning you get less hot water in your home and waste energy. Every year, drain a few gallons of water out of the water heater to get rid of sediment buildup. This sediment can keep the water from heating efficiently, making the heater work harder. Clean the dust out of light fixtures. This is primarily a safety precaution to prevent fires, but clean fixtures can prevent overheating of the bulbs which can cause them to break sooner. Use small desk lamps or lighting fixtures for desks and workbenches. This saves you from needing to light an entire room for a small task. When leaving a room, be sure to shut the lights off. Finally, switching to energy efficient CFLs or LEDs will save energy, and these bulbs last much longer than old incandescent bulbs. Set your thermostat a few degrees above (summer) or below (winter) your preferred temperature to save energy. Each degree can amount to 1-3% of savings. Use a humidifier in the winter when it’s dry. This helps you feel warmer than the temperature setting itself. In the summer, use fans in conjunction with the AC. Fans create a wind chill when you are under them, making you feel cooler. Laptops use less electricity than desktops, so use those whenever possible. Don’t leave computers running when not in use. This draws a lot of electricity and can also wear out the computer faster. Put them into a sleep mode or turn them off if you won’t be using them for a while. Unplug the electronics in entertainment centers as even though they are off, they still draw electricity. Plugging all of the electronics into a power strip can save you a lot of hassle, as you can just unplug the power strip to shut everything off completely. All in all, just be conscious of the energy you use daily. Take steps to reduce the amount of energy wasted and you will see your savings increase. If you are looking to replace any appliances or electronics, consider purchasing Energy Star certified products, as they are 20-30% more efficient than their counterparts. Remember that in addition to these tips, you have the power to choose your Houston electricity provider. Shop Houston Energy can help you find a provider that offers cheap electricity, giving you even more ways to save. Energy efficiency saw a major upturn beginning in 1992 when the Environmental Protection Agency (EPA) started the Energy Star program. The program was designed to take new and existing products and improve their overall energy efficiency. This was to help combat the growing effects seen by pollution and mining for fossil fuels and gas. Energy is a voluntary program, meaning that people have to willingly participate by purchasing Energy Star certified products, but how exactly does a product become Energy Star Certified? The Energy Star logo may be commonplace to some. You can often find it adorning the box of an appliance or electronic device, but that little logo represents a big improvement. To get this badge of honor, a product needs to be at least 20% more efficient than the minimum energy efficiency standard for that product class. High efficiency Energy Star products are typically 30% more efficient. In addition to the energy efficiency, the products still need to fulfill their intended purpose without losing quality. That is to say, for example, a refrigerator can’t just be 20-30% more efficient, it still has to keep contents cool to the temperature set by the user. The products cannot sacrifice quality for efficiency. Energy Star rated products often cost more than their uncertified brethren. In this case, the Energy Star version must be able to recoup the cost difference in energy savings within a reasonable amount of time. The Energy Star label also needs to show the energy use difference between the qualified product and other models. This gives consumers the power to choose a product that will most benefit their needs. The methods for improving efficiency do not need to come from a single manufacturer (i.e. the product manufacturer) but can come from third party manufacturers using nonproprietary technology. There are certain factors that can affect the standards necessary for a product to be Energy Star certified. If the Federal minimum efficiency standard increases, so too will the minimum requirement for certification. As technology improves, Energy Star may set higher goals for already efficient products to be even more efficient. Once products reach efficiency levels over 50%, Energy Star tends to reevaluate them and look for ways to further improve on their efficiency. Product availability, performance, and quality can affect the requirements for certification. This includes incidents where consumers are not seeing the promised energy savings promised by the label. Coupled with cheap electricity rates in Houston, Energy Star rated products can really save you a bundle on your home energy costs. Shop Houston Electricity will help you sort through Houston electricity companies, finding one with a low rate or one that provides renewable energy for your home. All over Texas, wind farms have been cropping up, providing clean, renewable energy for much of the state. Your Houston electricity company more than likely offers this type of energy for use in your home. You have the power to choose several different plans, and many of them use renewable energy like wind power. Under the plan description, in the Electricity Facts Label (EFL), it will tell you how much of your electricity was generated using renewable sources. By purchasing a plan with renewable energy, you are helping fund the renewable energy sector, creating green jobs, and making your voice heard for cleaner, more sustainable power. Green energy plans tend to cost a little more than typical plans, but the extra cost goes to cover the expenses incurred for the power generation, maintenance, and integration into the local grid. In some areas where renewable energy is not directly sent into the local grid, you can purchase green credits. Green credits essentially go toward paying for renewable electricity generation in another area, but you are still contributing to a greener world. Electricity is electricity regardless of how it is generated and there is no difference between coal fired electricity and wind generated electricity. But, green credits go toward funding the renewable energy sector while still supplying you with electricity from other sources. Some energy markets let you choose where your electricity is generated from. You essentially are buying shares of electricity from particular sources, covering the costs of generating the electricity from that particular source. Whether wind, water, solar, coal, or gas, you pay for the energy source you want to succeed. While most people look to find cheap electricity rates in Houston, those who spend a little more to contribute to a more sustainable energy market will make the future brighter for all of us. When shopping for renewable electricity, the retail electricity provider will display the percentage of renewable energy. For example, it might say 12% renewable or 100% renewable. The higher the percentage is the more renewable electricity it contains. You can contribute to Earth Day by signing up with a renewable electric plan that helps the environment. If are already going green in your home, then why not go green with your powering your home. If you are a business owner, you can even have a green electricity plan for your business. Do you part for the environment and help out mother nature. Looking at your electricity bill can be a bit overwhelming at first, especially if you see a lot of terms that you’re unfamiliar with. We’ll give you a good look at the common terms and their meanings so your next electric bill won’t be so intimidating. Base Charge — This is the flat fee you pay every month for electricity service. Current Charges — This is the total amount due on your bill. Demand Charge — This charge is based on how much electricity is used during a high demand period. Energy Charge — This is the cost based on how many kilowatt hours (kWh) were consumed by your home or business. Meter Charge — This is the cost of sending someone to read your electricity meter. Recurring Charges — Any charges that occur monthly outside of your service plan will be listed under this. Non-Recurring Charges — Fees like late charges, returned check fees, and restoration of service charges will be listed as a single charge under this. Amount Due — Any unpaid balances from a previous bill will be listed as an amount due. New Services or Products — Any new features that have been added to your service since your last bill will be listed here. Change in Rates — If you have a variable rate plan, where your cost per kilowatt hour (kWh) changes from month to month, you will see the difference between you current rate and previous month’s rate here. Late Payment Penalty — If you’re late paying your bill, you will be assessed a one time fee of up to 5% of your bill amount. Outstanding balances cannot be re-penalized and they do not apply to residential or small commercial consumers on the Provider of Last Resort (POLR). City Sales Tax — Sales tax collected by the state, city, or municipality you reside in. Advanced Metering Systems Surcharge — If your home or business has a smart or advanced meter, you will find this charge on your bill for its use. Competition Transition Charge — You may see this charge if you switch from one TDU to another. Energy Efficiency Cost Recovery Factor — This is essentially a passed down cost recovery for the implementation of energy efficiency programs and systems. PUC Assessment — Fee for administering the Public Utility Regulatory Act. REP Charges — Some Retail Energy Providers (REPs) incorporate all their charges into the price per kWh, but others may list each individual charge separately under this heading. TDU Delivery Charges — This is the cost to get the electricity to your home. Transmission and Distribution Surcharges — Any surcharges the TDU adds will be listed here. Transition Charge — Utilities are allowed to recoup costs for securitization of debt caused by the deregulation of the energy sector. This charge covers the cost of transactions for the purposes of this recovery. System Benefit Fund — This charge, set by the Public Utility Commission, pays for energy efficiency and education programs. The cost cannot exceed 65 cents per megawatt hour (MWh). Miscellaneous Gross Receipts Tax Reimbursement — This fee helps REPs recover the cost of the aforementioned tax for towns and cities having a population greater than 1000 people. One thing to keep in mind is that these bill charges are state regulation. These charges would apply regardless if you were with the local utility company or a retail electricity provider. Texas deregulation gives customers the freedom of electricity choice. Benefits of shopping with a retail electricity provider (REP), are that there are plenty of plans for customers to choose from for their electricity needs.